Earning a master's in conflict resolution online may help you achieve your professional goals without disrupting your current familial or professional obligations. This degree emphasizes the conceptual and practical knowledge needed to become an effective negotiator in cross-cultural conflict resolution. With a projected job growth rate of 11% over the next decade, nearly 1,000 new mediation and conciliation positions will be available across the country. The outlook looks even more promising for careers in social service management: the BLS projects that that field will add approximately 23,000 jobs between 2016 and 2026. Arizona State University–ASU Online ranks #1 on The 10 Best Online Master's in Negotiation & Conflict Management Programs! ASU's master of legal studies with an emphasis in conflict resolution is delivered through the Sandra Day O'Connor College of Law. The degree provides a foundation in U.S. law to professionals across industries, not just legal practitioners. ASU students in law, business, sustainability, or mass communications may pursue this degree concurrently. This 30-credit degree has four required courses: conflict theory, mediation, foundations of dispute resolution, and negotiation. Students can focus their studies in intellectual property law, sustainability law, criminal law, HR and employment law, or sports law and business. Graduates will have the knowledge to determine whether an attorney is required to resolve professional and personal conflicts. They will also be able to use legal concepts in their own professions. The MLS is a hybrid program. Most coursework is available online, but two on-campus sessions are required at ASU's Phoenix Campus at the Beus Center for Law and Society. The school provides a scholarship to each distance learning student to assist with travel expenses. The MLS is one of the most popular graduate programs within the College of Law, and can be completed in one year. Applicants must submit a writing sample and personal statement. Entrance exams are not required. ASU is regionally accredited by the Higher Learning Commission. Northeastern University ranks #2 on The 10 Best Online Master's in Negotiation & Conflict Management Programs! Located in Boston, Northeastern University has a long history of engaging with the global community. The MS in global studies and international relations with a concentration in conflict resolution prepares students for careers in business, education, and international relations. International consultants and diplomats teach the major courses. Faculty members assist students with their job searches, and graduates have secured positions in foreign embassies, the United Nations, news outlets, and nonprofit organizations. The degree program focuses strongly on experiential learning. Students engage in mock debates, write speeches, and analyze investments made by foreign governments. Distance learners apply knowledge to real-world political and economic challenges. Online students have the option to participate in the international field study experience, a 12-week online course followed by a one-week session overseas. The 2018 location is Italy. Courses include peace and conflict; international conflict and cooperation; postconflict development; the practice of diplomacy; and nuclear nonproliferation. Students must also complete a regional studies course in an area of interest such as Latin America or East Asia. In order to graduate, students must complete a case study, thesis, or international field study. There are a variety of program start dates throughout the year. Northeastern is regionally accredited by the New England Association of Schools and Colleges. George Mason University ranks #3 on The 10 Best Online Master's in Negotiation & Conflict Management Programs! Mason's online master's degree in conflict resolution is delivered through its unique School for Conflict Analysis and Resolution (S-CAR). Working on initiatives like the Sudan Project, research on Western Europe's migrant integration, and the Genocide Prevention Program, students within this school actively contribute to peace efforts in conflict-affected regions. S-CAR's MS in conflict analysis and resolution is the largest in the world, with more than 1,000 graduates participating in an active alumni network. Approximately 500 alumni work in foreign capacities. This online master's in conflict resolution helps students understand what causes conflicts between people, within groups, and on an international scale. Students also learn how conflicts can be resolved and prevented. The 42-credit program includes 15 core credits and 21 elective credits. Classes include gender and violence, micro theories of conflict, and ethics and conflict. Students must also complete six credits of an internship or thesis. Distance learners must attend a one-week on-campus session in Fairfax, Virginia, typically held in May. The program is 90% online and the majority of classes are asynchronous. An accelerated online master's is available to S-CAR students in the last year of their bachelor's degree programs. Out-of-state online students pay less than their on-campus counterparts. Virginia residents also pay a lower rate. Online students are eligible for financial aid such as graduate student grants and tuition waivers. Applications are accepted twice annually. Applicants must have an overall GPA of 3.0 in their bachelor's degree programs. The school prefers candidates with work experience and prior coursework in social sciences. GRE and other graduate test scores are not required, but may be included if desired. Mason is regionally accredited by the Southern Association of Colleges and Schools Commission on Colleges. Nova Southeastern University ranks #4 on The 10 Best Online Master's in Negotiation & Conflict Management Programs! The MS in conflict analysis and resolution at NSU is offered through the school's Department of Conflict Resolution Studies. Coursework imparts knowledge of conflict theories, academic research, and resolution strategies. Graduates are able to effectively resolve conflicts in their personal and professional lives without litigation or violence. Required core courses include mediation theory and practice, communication dynamics in dispute resolution, and culture and conflict. In order to to earn this master's in conflict resolution online, students must participate in a supervised practicum in their home community. Full-time students pursuing the master's degree in mediation and conflict resolution online can complete the program in 15 months. Part-time students can complete the 36-credit program in two years. Distance learners must visit the main campus in Fort Lauderdale, Florida for five days each February and October. Students must maintain a 3.0 GPA throughout the program. Online students may elect to submit a thesis or take a comprehensive exam before graduation. Applicants must submit a writing sample, essay, and two letters of recommendation. Applicants must have earned a minimum GPA of 3.0 in their bachelor's degree program. Ideal candidates demonstrate a temperment of tolerance. There are three program start dates each year. Students who wish to continue their studies may apply master's credits towards NSU's Ph.D in conflict analysis and resolution. NSU is regionally accredited by Southern Association of Colleges and Schools Commission on Colleges. Creighton University ranks #5 on The 10 Best Online Master's in Negotiation & Conflict Management Programs! Located in Omaha, Nebraska, Creighton is a Catholic university rooted in the Jesuit tradition. It awarded its first master's degree in 1898 and currently offers approximately 40 master's programs, including the MS in negotiation and conflict resolution. Students gain communication and collaboration skills, an understanding of facilitation and mediation theories, and strategies to solve interpersonal and organizational conflicts. Distance learners also complete a class focused on conflicts around gender and culture. All courses are taught through a social justice viewpoint upheld by the school's Ignatian values. This 32-credit program takes 16 to 20 months to complete. All coursework is available online, but two on-campus residencies are required. Students must also complete a three-credit practicum in a professional environment. Students in this program may also complete a dual degree with two bachelor's, four master's, and two doctorate options. Online students are welcome to take some classes on-campus. Creighton provides a variety of graduate scholarships and encourages students to apply for tuition assistance through its graduate school. Applicants must submit a resume, two letters of recommendation, a statement of purpose, and a writing sample. If desired, applicants can opt to interview with a faculty member. Creighton is regionally accredited by the Higher Learning Commission. Touro University ranks among The 10 Best Online Master's in Negotiation & Conflict Management Programs! Located in New York City, Touro University was founded on the Jewish values of social justice and community service. This online college is headquartered in Los Alamitos, California, and was the first to provide an accredited and fully online doctorate program. The school's online MS in dispute resolution prepares students for careers addressing interpersonal, organizational, and international disputes. Leveraging skills in dispute resolution and negotiation, graduates pursue positions as consultants, mediators, union representatives, and managers. Students pursuing this master's degree in conflict resolution online must complete 36 credits, including 11 required courses and one capstone course. Coursework includes foundations of conflict resolution, the ombuds profession, and restorative practice. Students gain skill in critical thinking and oral and written communication. During the capstone project, students analyze a real world application of concepts learned during the program. Graduates will be able to determine whether disputes should be settled with mediation or arbitration. To apply, students must provide a transcript of their bachelor's degree with a minimum cumulative GPA of 2.5. Transfer students are required to have a 2.75 GPA. TUW has tuition assistance counselors available to assist students with identifying and pursuing scholarships and student loans. TUW is regionally accredited by the WASC Senior College and University Commission. Dallas Baptist University ranks among The 10 Best Online Master's in Negotiation & Conflict Management Programs! As a Christ-centered university, DBU strives to produce servant leaders that can positively impact society. DBU's online graduate program in conflict resolution is offered as part of the master of business administration. This program requires 36 credits: 24 in MBA coursework and 12 in the concentration. Conflict resolution management classes include advanced family mediation, employee negotiations and collective bargaining, and advanced business mediation. Students participate in hands-on practice mediation sessions. The program culminates in a strategic management capstone course. Graduates are qualified to conduct court-appointed mediations in Texas. This degree can be completed in 12 to 15 months through DBU's one-year track. Students may complete more than one concentration. The MBA can be pursued as a dual degree with master's degree programs in communication, education, global leadership, and ministry. This adds a year to total completion time. DBU regularly holds graduate open houses at its three Texas campuses. Application fees are waived for students who attend an open house. The DBU Graduate School of Business is accredited by the Accreditation Council for Business Schools and Programs. DBU is regionally accredited by the Southern Association of Colleges and Schools Commission on Colleges. University of Denver - University College ranks among The 10 Best Online Master's in Negotiation & Conflict Management Programs! DU offers a master of arts degree in communication management with a concentration in alternative dispute resolution. Students learn how to identify the causes of conflict in interpersonal and organizational settings, then apply negotiation and mediation strategies to solve them. Combined with effective communication practices, these tactics assist students in successfully managing disputes. The four concentration courses include: conflict theory, effective facilitation and presentation, negotiation principles and practice, and mediation principles and practice. This master's in conflict resolution online requires 48 credit hours and can be completed in approximately two years. Courses are delivered in 10-week terms. Students may choose to fulfill the capstone requirement by completing a project, seminar, or portfolio. Three electives must also be selected. The mediation theory course may be substituted for a 40-hour training class. If completed, students meet the training requirements set by the Mediation Association of Colorado and the Association for Conflict Resolution. Potential students must have a minimum GPA of 2.5 in their bachelor's degree program. Applicants submit a personal statement, resume, and two references. Entrance exams are not required. Students may transfer up to 12 graduate credits with a minimum “B” grade. DU's HyFlex courses meet online and on-campus simultaneously. Online graduate students may apply for DU's institutional scholarship or graduate impact scholarship. DU is regionally accredited by the Higher Learning Commission. Dominican University ranks among The 10 Best Online Master's in Negotiation & Conflict Management Programs! Located 10 miles from Chicago in River Forest, Illinois, Dominican is a Catholic university that has been providing education for over 120 years. The school currently serves nearly 1,000 graduate students, including those pursuing the master of arts in conflict resolution online. This unique program is designed to create peace in communities and prevent violence within families, workplaces, organizations, and internationally through the social justice work of graduates. Students may earn a certificate in mediation skills training, which is approved by the Circuit Court of Cook County. The curriculum includes a practicum, which can be completed within local communities. Chicago-area students can benefit from Dominican's partnerships with a variety of organizations, including the Circuit Court of Cook County and the local school system. Courses are fully online, but students must attend two five-day on-campus sessions at the beginning and end of the program. These provide students the opportunity to learn from professional mediators and engage in role-playing negotiation and mediation exercises. Ideal applicants should have three years of work experience, but can apply for a waiver. Potential students must submit transcripts, a statement of purpose, and two letters of recommendation. GRE scores are not required, but can be included if desired. Dominican is regionally accredited by the Higher Learning Commission. 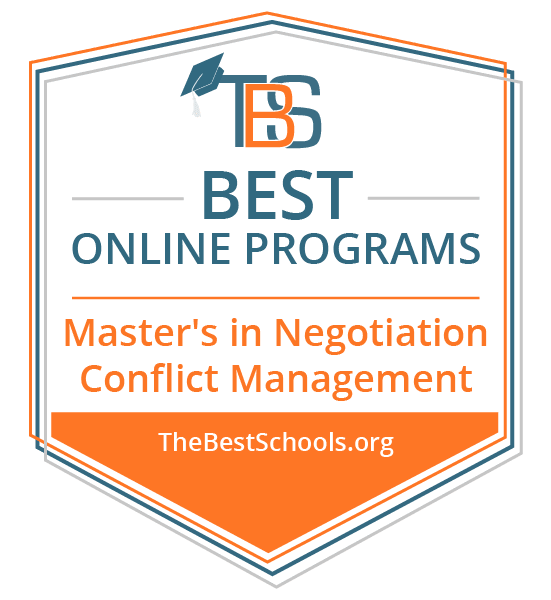 California University of Pennsylvania ranks among The 10 Best Online Master's in Negotiation & Conflict Management Programs! Founded in 1852, Cal U is located 35 miles from Pittsburgh in California, Pennsylvania. It is one of 14 members of the Pennsylvania State System of Higher Education.The school offers more than 95 graduate degree programs and approximately 75 online programs. Cal U currently serves more than 2,200 graduate students. This master of arts in conflict resolution online requires 30 credits and can be finished in five terms. It is 100% asynchronous. Students are grouped together in a cohort that completes the program together. The cohort model enhances peer learning and builds relationships and professional networks. Students learn strategies for mediation, arbitration, and alternative dispute resolution. Courses include: nonviolence theory and practice, ethics in global perspective, and communication and collaboration. In order to complete the program, students must either submit a thesis or identify and secure an internship. Applicants must have an overall undergraduate GPA of 3.0. Students with lower GPAs may be accepted on a conditional basis by submitting resumes with unofficial transcripts. Graduate students are eligible for Cal U scholarships, grants, and loans. Cal U is regionally accredited by the Middle States Commission on Higher Education. A master's degree in mediation and conflict resolution online equips students with the expertise needed to reach agreements between parties. Through foundational training in conflict engagement, facilitation, and resolution, graduates prepare themselves for rewarding careers focused on peacemaking. In addition to core coursework, a master's degree in conflict resolution online includes topics in research methodology, multicultural concepts of conflict, and the effects of interpersonal dynamics on cooperation. Students develop skills in specialized areas like healthcare negotiations, urban conflict resolution, and social media communication. Some programs feature dual degree options that allow students to earn two degrees simultaneously. Some programs that you can pursue in conjunction with a master's in conflict resolution include social work, law, environmental studies, and public administration. Most master's degree in mediation and conflict resolution online programs include a capstone seminar, thesis, or internship. While a thesis is usually optional, it is recommended for students who plan on earning their doctorate upon graduation. Capstone and internship requirements combine academic training with the professional world by providing integrative experiences that draw upon theories and practical skills taught throughout the program. While the skills of negotiation and conflict management benefit every occupation, professionals in mediation, politics, and human rights advocacy use their negotiation training daily. In addition to the ability to facilitate communication, individuals employed in this field have excellent reading, writing, and listening skills. Arbitrators, Mediators, and Conciliators: Individuals in these occupations have similar responsibilities, including settling disputes, investigating conflicts, and reaching agreements through negotiation. These professionals help clients come to an agreement without involving legal courts. A master's degree in conflict resolution online prepares students for careers in mediation and conciliation. Political Scientists: Through in-depth examinations of political systems, political scientists determine the effectiveness of policies on both government operations and societies. Many political scientists work with specific populations to better assist in the planning and development of policies that impact communities. A master's degree is often required for employment as a political scientist, and many researchers transition into teaching positions at the secondary or postsecondary level. Social and Community Service Managers: Employed by numerous social service organizations, these professionals have specific occupational duties or engage in a variety of tasks. Graduates of a master's in conflict resolution online often pursue social service careers in case management, human rights, and conflict prevention.